Many of you may have seen that a few weeks ago, I asked via Twitter about a good system to monitor my baby’s breathing at night. You guys were all so awesome and gave me so much great advice and shared so many products with me! 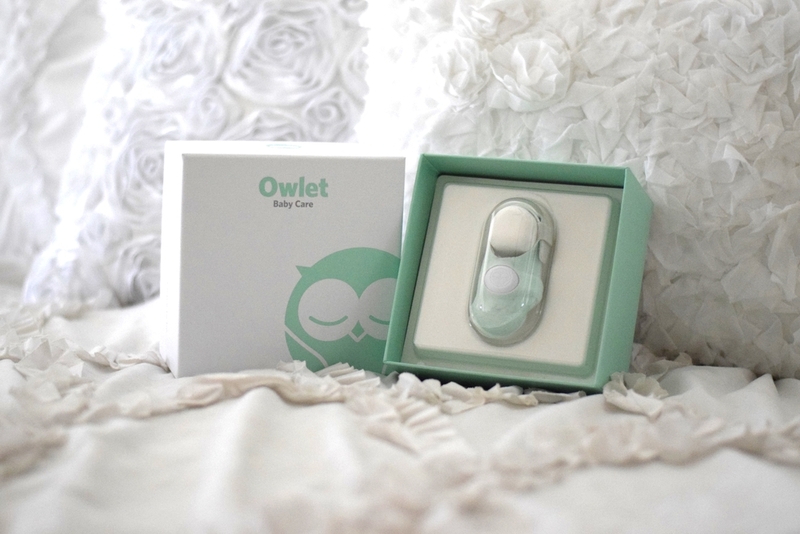 One product that kept coming up over and over again was The Owlet baby monitor. Not only did a bunch of moms I’m connected with online mention it to me, but my mommy friends and even family told me about it. Some moms even told me it alerted them, so they could intervene! With that, I knew it was something I had to check out. Well after a TON of research (and I mean a TON!) I decided to go ahead and get The Owlet monitor. It uses the same technology that hospitals use to track breathing and heart-rate, which was huge for me. If it’s good enough for the hospitals, then it’s good enough for us! And one of my favorite things about it is I can track it all on my phone. Plus, Kevin and I travel a lot for work (even though I plan to stay home as much as I can at the beginning of her life), so I really needed something portable. The Owlet is designed to alert parents if your baby stops breathing – no-matter where she is sleeping. This was important because she won’t be sleeping in her crib for about 6 months since we will want her in our room in her bassinet. And I’ve been told by so many moms that it’s trial and error while figuring out where the baby likes to sleep. Those are a few of the many reasons a portable option was so important to us. Once I received The Owlet in the mail I couldn’t help but get emotional thinking about my little girls foot in this little sock. I’m going to love her so very much that I’m bursting at the seems and I’ll do everything in my power to keep her safe. After I got the product, I reached out to the company and asked if I could give my followers a special offer and they said yes! Which I thought was so cool of them! If you get one, use code ‘BABYMANNO’ at checkout and get $25 off your Owlet! Get yours HERE. Do any of you use a baby breathing monitor for peace of mind at night while your little one is sleeping? What product did you use? Have you tried The Owlet? Would you try it? Let’s discuss in the comments section below! Thank you for the feedback. We will definitely be ordering this for our little girl. I sure would he watching her all the time if I didn’t get this. Yeah I am the same way!!! I would never sleep without this! Ali! Where are your PJs and robe from?! Do you know how long the discount code is good for? My little one is due in September and I have already put this on my registry. I don’t want to get it until after my shower in case someone already got it for me. I’m so worried he will stop breathing and I won’t know until it’s too late. I need something to give me piece of mind at night otherwise I won’t be getting any sleep! The code is good until the end of June! Maybe put the code on your registry so people know if they buy it for you! When is your shower? I’m sorry I’m at work and didn’t fully read the post I guess lol. I just read the full post again and see it’s only good until the end of June! Thanks anyway! This is fantastic! This wasn’t around when my kids were babies, so I used the angel care monitor. It had great intentions, but didn’t work that well. The owlet seems like a great idea. Nothing better than peace of mind while your baby sleeps. I didn’t go with that one because it wasn’t portable. Peace of mind at night is such a blessing! Good advice about putting the footie PJ’s over it! I will do that for sure! Thanks! Thanks for posting about this! My little guy is due in September and I already feel like I am not going to sleep since I will want to be watching him every second! I am definetly purchasing one of these to help ease my mind at night! Thanks Ali!! Thanks for your comment! And congrats on your little guy!!! Off topic here, but you always look SO stunning and ‘glowing’ in your photos! 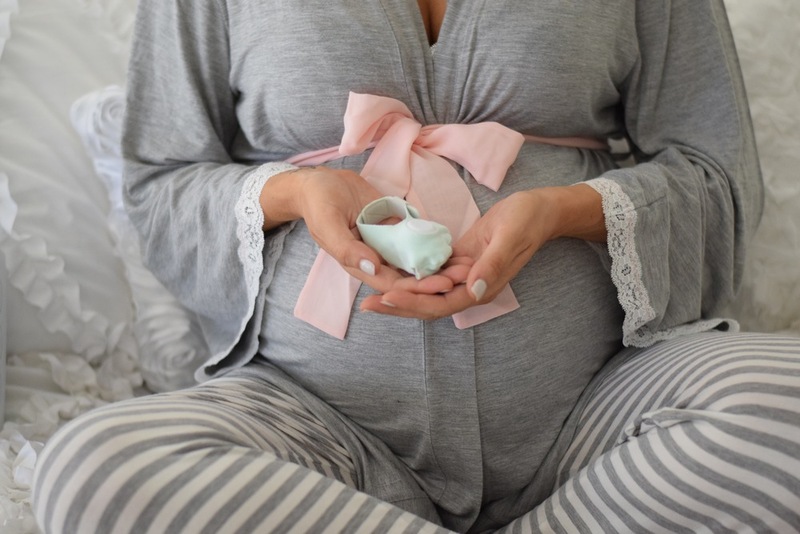 I’m sure pregnancy has something to do with it, (even though you were just as gorgeous before pregnancy) – What kind of camera are you using to take these photos? I’m obsessed! I am always so afraid I am going to be one of those overly obsessed mom’s who will not be able to take my eyes off my baby for one second. I’ve read so many reviews and done so much research and I found this one to be the best and I am a Google research queen. Y’all are so sweet and I’ll be praying for y’all during this special time! Did you compare this one to the Snuza?? I am trying to decide right now which one I want to get and I was leaning towards the Snuza exactly for the same reason of being portable, since I want my little one to be monitored no matter where they sleep! But I’m curious now about The Owlet! Let me know if you found any pros on this one over the Snuza! My little one will be here in October, so I’ve loved following your journey and get a glimpse of what to expect! I hope you don’t mind me butting in but I used the snuza and got consistent false alarms which will give you small heart attacks and for sure take years off your life!! They are horrible! It was fine while baby was laying flat on his back but like I sai in my post, as they get older they start wiggling more and even move to lay on their side of belly on their own. The snuza would lose contact then. Really only stays in place for first 4-6 months depending on your baby and how much they move! Hope this helps! Thanks so much for your insight! This is really good to know!! I think it’s great you did this! I have had so many people make comments to me about being "paranoid" and how "they turned out ok" etc. After watching three girlfriends lose their babies to SIDS within four months, it was all too real for me that it CAN happen to anyone! We have used the angel care with all our kids (I don’t need portability often) and love it! I tried the snuza and got way too many false alarms because as the baby gets older and rolls ride to side it doesn’t sit close to their belly anymore and gives you false alarms a lot, which are scary. Back to bed is right but you can only keep them on their backs for so long. I wanted breathing monitored til even after 1 year old so the angel care was perfect! Congrats to you Ali and Kevin! Enjoy! It goes so so fast! I had the snuza and it gave us a bunch of false alarms that scared the crap out of us and ended up making our paranoia so much worse! We ended up not using it after a couple of weeks and just kept him in our room in his pack and play. One month to go– you are in the home stretch! So exciting! ? We used the AngelCare monitor with our son, and it was nice to have that peace of mind. Although, in the beginning we had the sensitivity set really high and it gave us a few false alarms, which were absolutely terrifying. But once we figured that out, it worked great! Our son slept in our room for the first few months, and once we moved him into his room, it was also really nice to have a video monitor, so we could peek at him and make sure he was ok ? We have a Summer Infant one, and it works great! We bought a video monitor too! I want to see that little face all the time! ? My daughter turns two next month and I wish I had known about this before she was born. It seems like a great piece of mind. Congratulations on your pregnancy and welcome to the last month which feels like the longest month ever! Thank you for reading my blog! And I feel so lucky to have this. Especially since I know I’ll need any sleep I can get! I just bought the owlet for my baby girl who’s due in just a couple weeks. 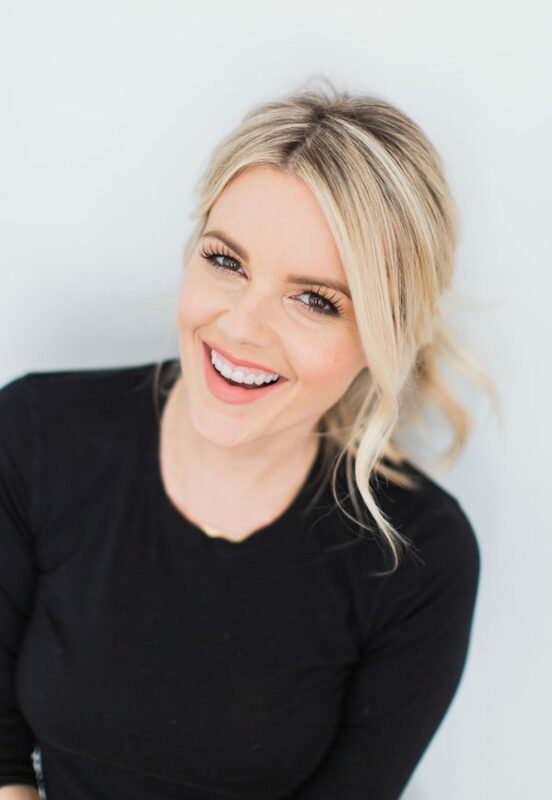 I’ve been a nurse for almost 10 years and when I discovered the owlet I was so excited to see someone had created a product like this! It really is just like what we use in the hospital. Best wishes with the rest of your pregnancy and with your little girl! Thanks for commenting! I love hearing from medical professionals like you! Makes me confident I made the right choice in choosing this! My little girl will be 1 year old on July 13 (can’t believe it!!). I co-slept with her for the first 6 months and once we starting transitioning her to her crib I was terrified she may stop breathing in the night when I wasn’t there to know. The sound and video monitor was great but as she started sleeping longer stretches at night it was terrifying watching the monitor and seeing her laying so still and peaceful just hoping she was still breathing. We got an Angelcare monitor and it was the best decision we’ve made so far. It gives us that piece of mind each night that she’s ok. And we’ve only had 2 false alarms in almost 6 months (she had shimmied her way to the very edge of her crib haha). The only drawback is like you said; that it’s not portable. When we travel it would be so nice to have something to take with us. I think you made the right choice with the owlet for its portability. You’ll be so happy with it. That piece of mind that your little angel is ok is worth it’s weight in gold Congrats Ali! Yeah we totally need the portability factor! Thanks for sharing your experience! Unfortunately we lost our second child to sids. We never had a motion monitor, just a video monitor. So when we had our third child we researched and decided to go with the snuza. I don’t remember the owlet coming up in our research. We had a ton of false alarms with the snuza. It’s possible it wasn’t around then. To be honest I don’t know that I would have trusted anything for this stage of our lives but every time it was a false alarm I would freak out and cry. Glad to know there’s something similar to hospital technology now. The hospital technology was such a important part of our decision to go with Owlet. But I’m so sorry to hear you went through such a heartbreaking thing. My heart goes out to you. I cannot image what that would be like. Hugs. My daughter is now 1 years old but this would have been so nice to have when she was itty bitty! Hopefully it has no hiccups like I’ve heard the Angel Care monitor has (false alarms – I opted not to go with this option as I would literally never sleep being uber paranoid). Invest in a stellar video monitor with awesome range, on/off sound option, room temp monitor, additional cam option, night vision clarity, zoom and pan. Homedics Sound Spa noise machine is my lifesaver – and so was sleep training. I became a sleep obsessed mama! But it paid off – sleep for the win! You can never ask too many questions as a first time mom, otherwise you will google to the end of eternity! ? Good luck with babes – girls are SO much fun! ? I wish they had had the Owlet when I had my first! We got both the Snuza and the Angelcare. The snuza is only good for those infant months as it moved around when they get older but I’ve used the angelcare up until last month with him. ( He will be 3 in July! ). I think it’s smart to have both as when they get older I can’t imagine them wearing the sock or the snuza. Love the owlet though and would have definitely chosen that! When my husband and I decided to start trying for a baby I always had a feeling we would have trouble. I was right. I have PCOS with a blood gene mutation. I didn’t know this was the reason we had so many issues. We ended up having to do tons of fertility treatment. Finally after a year of treatment we got pregnant through IUI. Long story short we had lots of scares through my pregnancy. I was so afraid something was going to take my baby away from me. I figured it would get better once I had him but it didn’t. My fears just got worse. When we brought my sweet baby home I would watch him 24/7 …I am not kidding. I would not sleep while he did because of my extreme fear of something happening to him. After a week I couldn’t do it anymore. After telling my mom and sister 3 days later my Owlet came. My sister had found this and told me about it and I knew then I needed it. But I wasn’t sure if it was worth the money. So my mom and sister bought it for me. THANK GOD!!! I literally could not survive without it. You have made the best choice as far as monitoring your baby goes. Now my little guy is almost 7 months and he is in his crib with his Owlet and I have been sleeping through the night since he was 6 weeks! We also have the angelcare monitor but we mainly use it for the video…nothing beats his sock. Also having their technical support team on hand is so very convenient. Congratulations on your little girl, being a mom is the best experience ever!! I’m a research queen too, and I think it gives me SO much peace of mind and confidence. I read many studies on SIDS reduction and a common theme I found was having the crib or cradle in your room for the first 3-6 months as the nearness has a notable correlation to reduced SIDS instances. Also, current research suggests that pacifiers also help reduce the risk as babies are less likely to sleep as deeply! Of course if my hours of ‘Google research’ have taught me anything it’s that no matter what you do, you can find a study to back you up, so you’re pretty much in good company no matter what choices you make! I’m a couple years deep on this parenting journey and I still feel like I can never consume enough information, the more I know the easier I am able to deal with whatever comes my way, and the better I understand what my little one is experiencing, the more patience and care I can give him as he goes through it! familiar with the owlet after one of my fb mom friends purchased this for her daughter after losing her oldest daughter to SIDS and I knew we had to have it express shipped to the house and it arrived a day after we got home from the hospital. We had one red alarm when she was a few days old that came buzzing through on my iPhone and her base station that alerted me "low oxygen alert" and I had her right next to me in her bassinet and picked her up so fast and was able to make sure she was breathing. Around 6 weeks old, my daughter was up and did not have the owlet sock on and she ended up going unresponsive for a good 45 seconds or so and right before she came out of that spell, we were about to perform CPR. She was transported to a children’s hospital and they determined she had an acid reflux spell that caused her to become unresponsive. We were sent home with an apnea monitor and because I worry, I put the owlet and the apnea monitor on at the same time and I can tell you that the heart rate for the owlet was always consistent with the apnea monitor(which the apnea monitor goes off randomly and has false alerts) The owlet has been my life savor. My baby is almost 3 months old and the anxiety I get leaving her with other people if I ever have to run errands is like no other. But if I ever do have to step out of the house, I’m able to monitor all her live vitals from my iPhone. Owlet has offered us such peace of mind. It’s truly an awesome product and I know you will love it as much as we have. I wish they had this when my son was born. He’s almost 11 months now and he’s been sleeping in his crib in our room since the day he was born. My anxiety and fears just can’t bring me to put him in his nursery just yet. It’s funny how overwhelming the emotions are and how attached you become to this new human. I love having him in our room. I hope you have a safe and healthy delivery. Congrats to you guys. Being a parent has been the best thing, and brought a whole new meaning to life. Hi Ali, how are you? I read your blog and follow you in Instagram all the time! My girls are 7 and 9 and boy do I wish we had this when they were born. I used a basic monitor, and that really was not enough food me, I never felt safe.? I have heard so many good things about this one, so you are very lucky!!! I am so excited for you, enjoy every minute, every second because it goes by just so quickly!! I wish you a smooth delivery for you and that sweet baby girl, you will do great! Cannot wait to see pictures!!! Love you dearly….Kristin?? I have 2 children. I’m in my 50’s so things are different now. I feel unless she has a heart condition or there’s long QT syndrome in the family or a case of SIDS in the family, I wouldn’t monitor her. It will drive you crazy and these things aren’t 100%. Don’t use bumpers. I just made sure they had the breathable mattress and had them sleep on their side. We had an angle sponge made for that. You have to make sure you rotate left and right otherwise their skull will grow towards the one side. My daughter favored her right side so I put her on her right side! (First child) I brought up her odd shaped head to the pediatrician and he said some kids just have odd shaped heads ??. She had a perfect head when she came out C-section! I worked in CT scan. One day the pediatric neurosurgeon came in the control room and my daughter was there. She was @6 months old. He said "She likes to lay on her right side doesn’t she?" I said yes because she always cries on her left. He told me she had to start laying on her left side or when her sutures in her skull harden, she’ll have a permanently odd shaped skull. He said or she’d have to wear the special helmets for about a year. I put her on her left side and her skull did even out. I told her pediatrician what the neurosurgeon said. I was mad! Thank God the neurosurgeon came in when he did. I had to correct myself. Actually, I think my daughter was around 2 months old. Because at 6 months she would’ve been turning herself to however she wanted to sleep. My menopause brain! Ugh! I also wanted to add, these monitors can also give you a false sense of security. The monitors the hospitals send you home with if your child has a possible heart rhythm problem even alarm when it shouldn’t. Parents jump out of bed and everything is ok. Idk. I was more relaxed with my kids just laying on their sides. Oh! And no blankets. They have the sleeper, papoose kind now. Can’t wait to see pics of your baby girl when she’s born! Ali where is your robe from?? It’s adorable!! My monitor has a motion detector that goes under the mattress. Which would be awesome if my kid was sleeping in his own room. Which was, in fact, my plan. But fun fact: when baby shows up, your plans do not matter. At 8 1/2 months he still sleeps in our room. However, I agree with others – if you have no history and no health conditions, you’ll drive yourself nuts. Same thing with video monitors. I do not need another reason to be glued to my screen. Thank you for the advice! My husband and I are now trying to get pregnant. I love reading your posts, I just hope I look as amazing as you do when pregnant. I wish you the best delivery and the healthiest baby girl. Als where did you get that outfit?? Love it! Even with the monitor, if it makes you feel better — go for it, make sure to listen to your momma gut. Sometimes I feel like, devices like this give us a false sense of security and we may not listen to our gut because the device said everything is OK. That being said, after having just lost our second to stillbirth, I can totally see investing in one if we ever have another. Congratutions on upcoming baby! I’m 32 – mom of 3 +1 (16, 10 & 2.5 & 1otw). I’ve tried them all I swear! I have no history of medical conditions luckily. This being said, with EVERY child I had a monitor – my favorite so far are the ones with the cameras so I can see them. I don’t personally care for the ones under the mattresses cause they can give you false readings; and trust me when I tell you that you’ll be up voluntarily for the first two weeks (at least) checking up on her. Then as time goes on, you’ll relax. The camera is nice cause if you hear her. you can roll over and look as she may just be dreaming. 🙂 My advice? Go with your gut! Welcome to the parenting journey – you will be amazing! I love this monitor as well. I wish I would have known about it after having my son. I was always concerned whenever I put him down about SIDS and my friend told me about this A few months after he was born. I wish you all the best in your amazing journey into motherhood. It’s such a wonderful club to be a part of! Be Ready- My 1st child was 4 weeks early. 2nd & 3rd were 2 weeks early. ?Best wishes for an easy delivery? I just want to say congratulations! I remember that final countdown like it was yesterday ( my son is 17 months so not too long ago)! Enjoy these last few weeks of your pregnancy, it’s so hard to do but will definitely be a time you will miss! I used the Angel Care monitor with my son. It was a pad placed under the mattress and detected if he stopped breathing. I loved it and still use the video monitor now that he’s older! As far as sleep goes I’m not sure if I have ever gotten a full 8 hours since he was born. Even at 17 months I still wake up at night to check on him. See if he’s too hot, too cold, it’s just what moms do! But I wouldn’t have it any other way. Last piece of advice for you is during labor soak in every moment! I remember during mine wanting it to just be over. You are so focused on the end game that you forget to take a step back and just be amazed at everything going on. Now it’s hands down the day I wish I could keep reliving. Even through all the pain, fear, and anxiousness it will be the greatest day of your life! Wishing you a safe and healthy delivery! First, I’ve been a fan of yours since the beginning! Congrats on your soon to be bundle! I am a newer mommy myself (18 months has gone fast!) and reading your thoughts about a very important product is encouraging! Our babe slept in our room for 4 months. When we transitioned to his crib, I watched the monitor hourly. I had the volume on full blast so I could hear his every move! I love that you did your research! I think so many new mommies miss this because they are so overwhelmed. I’m in the process of writing (and finalizing) my first ebook. It’s all about the things I went through before, during, and after pregnancy to encourage new mommies and let them know they aren’t alone. Thanks for your insight and being so loyal to your fans! Enjoy your sleeping while you can! My daughter almost died at birth so we were in the NICU for 5.5 weeks. When she finally came home she was on oxygen full time and then had a stat monitor on at night. It still worried me something would happen but I think you can’t worry too much otherwise you will drive yourself crazy! Enjoy every second with your little one. We made a "rule" of no chores when she is awake. They are only little once and my husband and I knw too well how it can possibly be gone in an instant. When my daughter was 3 weeks old I noticed that she would pant rapidly like she was trying to catch her breath and then just stop breathing for a couple seconds and staff the process all over again. The Drs said it was normal but I would stay awake to make sure she was breathing. I did all kinds of research and talked to the parent experts with owlet and ordered this. I was so impressed with how fast it got here and the amazing customer service! Now that my baby is almost 5 months old and super into her feet the monitor sings and flashes yellow when I know she’s moved it. I’ve also gotten the red alarm from when she fell asleep in a position where she wasn’t getting the best amount of oxygen. Honestly, this is the best thing I could of ever purchased! My daughter was born in February of this year and I was in the same boat! Wanted the best system possible to give me peace of mind while she was sleeping at night. After much research we heard about the owlet system. I instantly knew it was the right thing for me. My baby girl spent 2 days in the NICU, hardest 2 days of my life. She was hooked up to all these monitors and it was in that moment I realized I would have that type of technology to ease my mind in the form of a cute little sock. Now 4 months old, she wears her little owlet sock every single night. She has only kicked it off once. I have to say, it’s one of the best purchases we made,I know she is safe and I sleep much better knowing I’ll be alerted if anything goes wrong. Best of luck in these last weeks of your pregnancy!! Hey Ali! I’m glad you posted about this because I have been debating whether or not to purchase the owlet. I was due a week before you, July 5th, and I had an emergency c section middle of May. My baby girl has been in the NICU. She’s doing great and we are excited to get her home. The first couple weeks were rough b/c I was healing from the surgery and I had to accept my baby came early. I felt bad… Almost guilty as if it were my fault. But I know some things just happen. We have been going to the hospital 3 times a day to see her. She’s doing great! Drinks all her bottle and is gaining weight! She’s adorable and I can’t believe she’s here. In a way I had no time to get nervous about her arrival bc it all happened so quickly. Although while I was pregnant I have had the exact same thoughts you have been writing about! But anyway, seeing that you bought this has made my decision easier. Since she’s in the hospital I know she is being monitored so I’m used to that comfort. Buying the owlet will make me feel comfortable while I’m home too. And, you’re going to make an amazing mom… Let me tell you that once you see her everything just makes sense. I can’t explain it. I would sit at work and just talk to my friend who had a baby and I would just talk to her about how crazy it is that I’m going to have a baby and she’ll be mine, and I’ll be a mom…. It’s all surreal to think about bc you haven’t met this cute precious baby. But like I said, the moment you see her it just makes sense. Good luck! I can’t wait to hear about her! The Owlet was not around when I had my first but oh I wish it had been! My daughter started sleeping all night at 6wks. I was a nervous wreck checking on her constantly. We ended up purchasing the angel care monitor and were happy with it as well since portability wasn’t a huge issue for us. I cannot tell you the peace of mind it gave us! Congratulations…you’ll be a great mom! That looks awesome! My baby girls are now 8 1/2 and 13. They really had nothing like that back then. Every night and seemed like every nap, I’d be sitting there with my hand on their chests and under their noses to make sure they were breathing. Best wishes with the new baby girl! Truly enjoy every minute, it goes fast! Before you know it, they are turning into beautiful young women! I have the Owlet and it has been on my 2 month old since he was 1 week old. I am a first time mom, (with a husband who sleeps through everything!!) a worrier and a very light sleeper so having the peace of mind that he was being monitored while I slept was the best! I recommend this to everyone and always buy it off registries if possible. Congrats! We didn’t use anything but loved our Halo Swivel Bassinet. congrats Ali! We use the Owlet with our preemie daughter and it is so very well designed and worth every penny. It has gone off only twice in the 8 months we have been using it with a low heart rate alarm. We don’t know if it was a false alarm or not, but we don’t care. We were able to check her and she was ok and I am so thankful for it! You will absolutely love it! Hey Ali! 1st and foremost congratulations to you and Kevin!! This is such an exciting time for all 3 of you! I wanted to share with you that as a newborn I many episodes of apnea and was required to stay in the hospital for several weeks. I was able to go home a test subjectwith one of the first apnea monitors developed by researchers at Syracuse university. From what I understand the technology was so new at that time that it was very unreliable in that the monitor would constantly go off. So when it came time for me to have my 1st child I was extremely nervous. One thing you might want to consider if you already haven’t done so, is meet with your chosen pediatrician to discuss your fears and have a plan in place with him/her about what would happen if your baby does have apneic episodes while you are still in the hospital. I did that at 30 weeks and it brought me a lot of comfort. My husband and I decided to have Ryley sleep in the nursery at night to be observed. The nurses would bring him to me to nurse and then bring him back to the nursery. He did great!! Not one episode of apnea! So we brought him home and I had a cosleeper in our bedroom that I put the seat of his swing in propped up with a pacifier and a ceiling fan on. Everything is going well, my husband and I are all settled into bed and all of a sudden Ryley takes this breath that was much different from his normal breath. It was kind of like sigh but wetter sounding if that makes sense? My husband and I literally jump straight up to see what was wrong. Ryley looked fine though. He was sleeping soundly and breathing just fine. Well I could not sleep the rest of that night. It was not until the next morning at our 1st post hospital pediatrician appointment did anyone tell us that newborn babies make all sorts weird breathing sounds especially when they are sleeping. When babies are1st born they haven’t totally figured out the whole breathing and pooping thing. So your baby might get the hiccups quite frequently which is a good sign that they are "catching on". I so wish I had that piece of knowledge prior to bringing Ryley home…it would have been very useful! I wish you well and am hoping you have a very easy labor and delivery! I am so glad I came across your blog. I am a new mama. My baby just turned five weeks old. There are truly no words to describe the feelings and emotions that you feel when you meet your little babe for the first time. When you are pregnant, you are already in love with your little one, but my oh my does that love multiply by a million when you finally get to hold that precious angel in your arms. The love you feel is overwhelming but so is the fear. Being an experienced ICU nurse, I did not think I would be as worried as I was when I had my little guy. I was so afraid that he would stop breathing when I put him to sleep. The thought of SIDS was always on my mind ans because of that I decided to purchase the owlet. So far it’s been great and it has allowed me to get a few hours of sleep. The only drawback is that it can leave pressure marks on your baby’s foot. I always take the sock off with every feeding and diaper change throughout the night for fear of it creating a pressure ulcer on my baby’s foot. The company includes two socks in the newborn size for that very reason. Also,I’ve noticed that it sometimes takes a few minutes to alarm if the sock falls off. All in all, it’s definitely one of the best purchases I’ve made. I hope that you have a safe and healthy delivery and I am so excited for you to meet your sweet baby! Where is this robe from? I am obsessed! Looks like a perfect robe to pack in a hospital bag! Love reading your blog…I’m 15 weeks today! One of my main reasons for being done having kids is because of SIDS danger. After losing my first baby (miscarriage in the second trimester) I worried myself absolutely sick that something would happen to my boys. You look absolutely beautiful and have always been my favorite bachelorette. Congratulations and take TONS of pictures, they grow so fast. Keep a calendar of things she does; scooting, rolling, etc… You may think you’ll remember it all, but you don’t. Lastly, write down everything! Diaper changes, feedings; how long she fed/how much, etc. Mom brain is so real and when the pediatrician asks you those questions, you’ll have it convenient. I’m due at the end of August with my first baby! Thank you for posting about this! Seems like a wonderful extra piece of mind! First of all, congratulations on your sweet baby girl! I bet you can’t wait to meet her! I’ve been following the Owlet monitor since the beginning of their development stages and have wanted one ever since! I’m due at the end of July and plan on getting it for our little guy- and for my sanity ? This is my 7th pregnancy, with 2 live births, so far, and 4 losses. Our most recent loss was in August 2015- a sweet little boy we named Wesley who was stillborn at 20 weeks. Paranoia that something will happen to this new little man is sky higher for me!! We have tried other monitors with my 2nd baby due after I woke up a few times to her not breathing (hello, terrifying! ?). Each of the other monitors has its strengths but definitely limitations as well. The Owlet seems to cover all the bases though. I think the peace of mind, ease of use, and portability of the Owlet is totally worth it!! I have used the owlet now for about 7 months. Customer Service is AMAZING! I would totally recommend this to any new parent. My baby boy was a NICU baby, and actually stopped breathing when he was born. I cannot and will not sleep without it. You’re gonna love it!! I wouldn’t waste my money … The low alarm for the O2 can’t be changed, factory is 85 (they finally upped it from 80). Baby would be blue by the time it alarmed you. I have a medical baby, so we use what the hospital suggests, not worth it for us. Ali, I’m a first time mommy (delivered 3 weeks ago to a little baby girl) and the Owlet allowed me to sleep at night! I wasn’t sleeping for the first few days, just watching her breathe all night long! I finally realized I couldn’t do that forever, and like you, did a TON of research. This product is amazing! There has been a couple times we didn’t put it on tight enough, and our little wiggle worm kicked it off and the monitoring system immediately signaled it had fallen off. I know it was immediate because I watched it happen! The company is seriously awesome from their customer service to the products they offer. I’m obsessed. I know that this will allow you to get the much needed sleep you will need as a new mommy 🙂 congratulations on your little miracle!! Ps what bassinet did you purchase for your room?? We are looking for one. We currently use a Rock n Play which she loves, but I would like to lay her flat on her back instead. She was 3 weeks early so I liked the Rock n Play up until she got a little bigger. We decided to purchase the owlet after our little girl began to rock and roll in her bassinet around 3 months. She was still swaddled (the only way she would go to sleep) and when she rolled to her side or worse…her stomach – I feared the worst. The Owlet let us have some peace of mind during her transition to an "arms out" swaddle. When you get the monitor, make sure to adjust all the alarm settings to your liking. We just took the owlet on a trip to a place with a spotty internet connection so we had to adjust the alarms so we weren’t up all night. We are so lucky this day and age to have technology like this. Thanks to the makers of the Owlet, we can save our anxiety for other things! Enjoy your last month…best of luck with your delivery and enjoy your baby girl (they really are the best). Robe, pants, and that bedding ?? where are they all from?! I found out about the owlet after my little guy was 8 months.. We never purchased it but plan to for any future babies ? I’m a mother of two and I totally get the wanting to protect your baby at night thing. I was so nervous at night with my first child. What helped me is keeping my babies in my room for the first 3-ish months so I could hear them and be very alert to what was going on. Once I got a couple of months under my belt with the baby and they were sleeping for longer stretches so I wasn’t getting up as often to nurse, I moved them into the own room, set up a video monitor, and just prayed. I kept telling myself that I cannot control everything in my child’s life and no matter how many precautions I took, my child will still get hurt and bad things could happen. But I didn’t want to live in constant fear so I learned early on to give my child to God, to trust that I am doing the best I can and know that no amount of planning or monitoring will ever be able to keep my children 100% safe and the earlier I learn that lesson the better. This may sound like a downer but really it helped. And of course, my kids are almost 5 and 2.5 and I still check on them multiple times while they sleep. It’s just what parents do. Oh, and turn on a fan in their room. It’s shown in multiple studies to reduce SIDS by 50%. 50%!!!!! And it drowns out noise so double win. I completely agree with Kaytee. I am a new mommy too and unfortunately there are things that we can’t control. I was terrified and scared as well during the first 3 months that my baby would simply stop breathing at night. She slept in her crib which was standing right next to my side of the bed so I could see and feel her at night (and trust me you do wake up when you feel like something might not be alright, it’s maternal instinct). Where is the robe from? I would love it for delivery. Hi! I have this monitor and I can’t say enough about it. It gives me the peace of mind I needed. I am also a baby & child sleep trainer and I recommend it to a lot of my clients. Everyone I know that has it, is very happy with it. It is well worth the cost and more. I am so thankful to have this monitor in our life! There are so many baby products out there and for me this is a must-have. Congrats Ali!! She’s perfect I’m dying to know where you got this grey maternity PJ set!!!! Pleas tell us!! Also I believe some of the bedding is from Lush Decor. I had it in purple. What outfit are you wearing in this post? I need it for the hospital!